At her studio in Darb17/18, in the heart of Old Cairo, Farah AbdelHamid is assembling a pile of silicon bubbles in pale colours. These bubbles, she explains, will make up part of the exhibits she is planning to show at 2019 Venice Design, the international design exhibition running alongside La Biennale di Venezia, where around 50 international creators from 30 different countries and of various cultural backgrounds are invited to present their processes and visions of design. AbdelHamid will be putting the bubbles one next to the other up the arch of a door to represent "a body’s communication with the object." 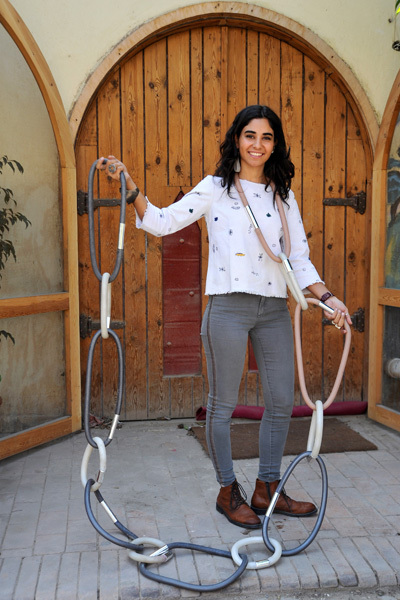 For the same event, which is sponsored by the National Bank of Egypt, Misr El-Kheir philanthropy foundation and the private sector's ElSewedy Electric, she was also finishing her silicon and metal seven-metre-long chain, which could be "worn by one or two people around the neck or the waist." "Again, this is to show the multiple ways a body can be connected to a piece of jewelry," she said. This body-object connection underlines the 'Farah' design scheme. "The purpose is to create and recreate a new sensation and engagement between body and jewelry,” she explained. By so doing, AbdelHamid said, there is real room to "undo the social construct of jewelry." "I want to get the jewelry out of the box, because I would not wish for jewelry to be strictly seen as ornaments, although they are, but they are not just that," AbdelHamid said. This contemporary jewelry designer is not just interested in making beautiful necklaces and rings. She rather wants to think of "what makes a necklace a necklace and not a bag, for example." "I guess it is all about this connecting lines that bring together or maybe divide jewelry as jewels, ornaments and accessories," AbdelHamid argued. For AbdelHamid, what really brings these pieces together and actually gives them their function and beauty is the human body. This is why, she argued, one person may be happier and prettier with a particular jewelry item than another, and it is also why some people would be more attracted to a particular designer’s work, she added. "The body is the one common thing between the person who makes and the person who wears the jewelry – it is also the thing in common between these two and the person who sees the jewelry," she said. By underlining this core concept of body-object sensation, AbdelHamid hopes that her work will help free jewelry from typical social associations that make, for example, gold items more valued than silver. "The social association of jewelry, traditionally, I think, has included things like indicating a person's social status, in relation to the price of the metal and stones of a particular piece, or as in some social contexts, serving spiritual functions, like warding off the evil eye or healing woes and illness or designating a marital status, like in India for example where the adornments for a young woman are different from those of a married woman," she said. AbdleHamid is multi-disciplinary artist with a passion for contemporary jewelry. She received her formal training in jewelry and metalsmithing from the Rhode Island School of Design. 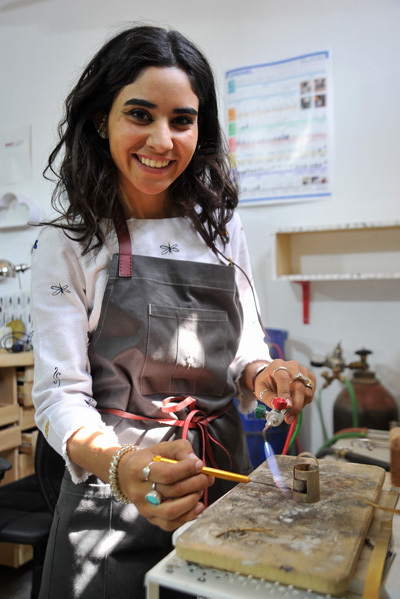 Since then, AbdelHamid has been showcasing her commercial and conceptual jewelry at fairs and exhibitions in and outside of Egypt. 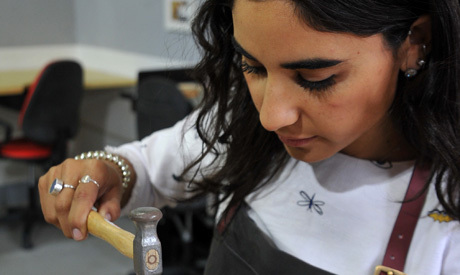 "I guess with the help and support of such foundations that are sponsoring the event, there is a big room for Egyptian designers to be an essential part of the contemporary jewelry-making movement," she said. "In general, I think that with such an incredible history of jewelry-making, techniques and designs from the pharaonic times til today, Egypt could well be branded for jewelry-making. "And there is always a room for a new take on traditional things." Through both her learning and teaching experience she said she has seen a growing interest in jewelry-making. With more and more people willing to embrace this art, she sees a growing making and maybe exporting market – maybe more for commercial than conceptual jewelry. The next "commercial jewelry" stop for her work is Milan Design Week. 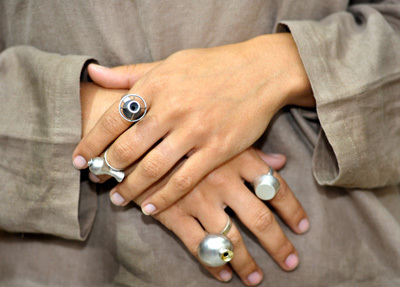 The underlining concept of her collection, which is a collection of rings and earrings, is "hollow objects." To be on display in Milan is one pair of earrings that is inspired by the shape of a Turkish coffee making pot. "I like to experiment with taking the traditional into a contemporary spot," she said. Experimenting, AbdelHamid argued, is essential for taking jewelry away from the otherwise inevitable path of design stagnation. "Adopt and assemble is something that I really like," she said. Is there a room in the Egyptian market currently for such contemporary concepts when it comes to jewelry? "Certainly; obviously an individual’s taste is the making of a combination of influences and clearly in Egypt today there is a growing interest in the contemporary – this is obvious from the expanding presence of concept stores," AbdelHamid answered. AbdelHamid is planning the launch of her sales in Egypt in spring or summer this year. It will be a diverse collection, some from the Milan Design Week collection and some other earlier items, with silver dominating, but also using silicon, gold and semiprecious stones.